When I was in college, I would do anything for a tasty meal outside the dining hall. Occasionally, that meant a mess in my dorm room, where the only real tools at my disposal were plates, cups, and flatware. I can say with confidence that mug desserts became a staple of my diet if only to add some flavor to my life—literally. Whoever created this movement of mug meals is nothing short of a genius. The ingredients list is typically short, and cook time is even shorter, all without dirtying a sink-full of dishes. It is a convenient hack that is great for beginner cooks and lazy adults alike, and it's growing in favor among foodies as well. If you fall into any of these categories, then go ahead and bookmark this page now. We have scoured the internet for some of the best mug recipes for you to whip up when you need a single-serve meal in a jiff (even if the recipe says that it serves two). We found breakfasts, desserts, snacks, and more desserts, so before you try these out, you may want to loosen your belt a bit. Most need just a mug and a microwave to prepare; be sure to check the power of your microwave before starting it up for fear of under or overbaking. Don’t forget to grab a spoon. If dessert strikes fear into a dieter’s heart, then this Paleo-friendly chocolate cake from Food Faith Fitness is here to save the day. With coconut flour and almond butter, this cake only needs around three minutes in the microwave for gooey perfection. The list of ingredients for Food Faith Fitness' strawberry cake can seem daunting, but the instructions are straightforward. Just be sure to pay attention as it cooks so the batter doesn’t splatter all over your microwave! How about a ridiculously simple breakfast meal in a mug? Save your stress for the rest of the day after devouring Hello Veggie's wholesome dish. Making this oatmeal is as easy as it gets, with just two steps: mix and nuke. A ramekin is basically just a mug without a handle. Use your most generous mug when making this creation from Hello Glow to pack in spinach and eggs for the oven, then cover with your choice of toppings. 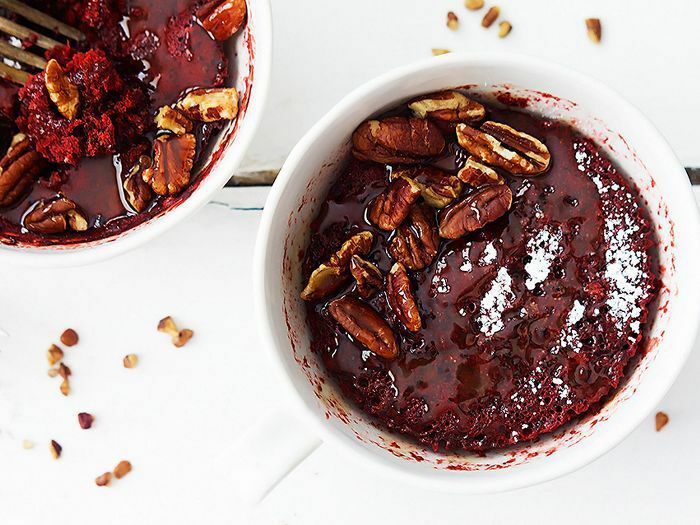 This dessert-in-a-cup from Food Faith Fitness requires the fridge, not the microwave. If you mix the ingredients carefully in the morning and stow it away until the end of the day, then you will have a simply delicious treat waiting for you after dinner. This recipe from Hello Glow is versatile enough to cook in paper cups—just be sure to poke a few holes in the sides before you begin. Glass drinkware works well as it is. Give this a quick 30 seconds in the microwave and a few minutes to cool, and voilà. Technology has gotten us so far that we can now make pies in mugs. This pastry from How Sweet Eats is stuffed with strawberries, but other berries work too, so long as you know the adjustments for the rest of the ingredients too. Jessica at How Sweet Eats was a mug-dessert denier before experimenting in the kitchen and coming up with this delectable creation. Thick chocolate and generous amounts of marshmallow make the meal. It’s always a blessing when you can mix and bake all in one container. And with a mug, you even have a convenient handle to hang onto as you whisk. Creme de la Crumb’s recipe for red velvet cake might be the perfect one on this list. Omelets on the stove take precision and care, but Joyful Healthy Eats knows a better way. Load your extras into a mug with a well-beaten egg, then after just a few minutes in the microwave, your breakfast is served. The batter for Boulder Locavore’s peanut butter and chocolate chip cake requires only four ingredients. And when they come together, the flavors may surprise you. For a classic, hearty cake, go for I am a Food Blog’s rich chocolate mug recipe. We can pretty much guarantee that there will be a spill over the sides as it cooks, but doesn’t the mess just make it all the more delicious? The only difference between these oats and the rest of our mug adventures is that they need to chill in the fridge instead of being heated up in the microwave. Hello Glow offers three variations on the same recipe, which is so easy that you could do it in your sleep—or better yet, right before you go to sleep so you can enjoy the cup first thing in the morning.